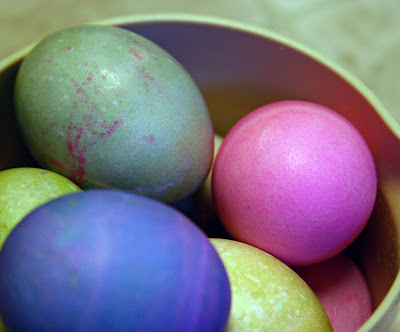 When I was a kid, my sister and I dyed real eggs. My mom would hide them on Easter morning and we'd search for them. It wasn't until I was 30 years old that I discovered other families hid chocolate eggs and plastic eggs full of candy and money. I was educated by a friend of mine, who regaled me with stories of her family's annual Easter celebrations. All the mothers filled dozens and dozens of plastic eggs with candy and marked a special egg for every child. Inside each special egg they tucked $20! My friend told me about the year that she was in charge of hiding all the eggs outdoors while everyone ate dinner inside; she hid the eggs so well, they couldn't find one of the money eggs. They looked in all the children's baskets, in case one of them had accidentally picked it up. No money egg. The adults split up and scoured the property, lifting stones and checking tree branches. No money egg. To this day, the whereabouts of that money egg remains a mystery. It has become a family legend, how great an egg-hider my friend is. I'm a odd mix of naivete and street smarts, I guess, because—although I had never heard of a money egg until her story and had, in fact, not participated in her family's Easter egg hunt—I knew exactly where that money egg was hidden. In Uncle Ernie's shirt pocket. Or maybe under little Benjamin's hat. That egg was found by a devious family member who knew how to keep his mouth shut. But I digress. I've tried over the years to do the same thing. Not hide $20 bills, but hide eggs full of candy and coins. And you know what? My girls prefer real eggs. They're not going to spit out a jelly bean if it accidentally falls into their mouth, but they really do get excited about collecting the most hen-laid eggs in their baskets. It means a good three days of yummy high cholesterol snacks. Tell me, what kid doesn't love a hard-boiled egg with a little salt? Or an egg-salad sandwich on whole wheat bread? Oh, right. Most kids. How funny that you never knew about the plastic eggs until your friend told you!! I have a friend that puts $20 bills in some of the eggs for her kids...that's a lotta money for a little 10-yr old!! My kids just ate some hard-boiled eggs for breakfast with a little bit of salt. We still have a ton of eggs leftover from our Easter party 2 weeks ago. I have never heard of hiding money in an egg! I grew up without Easter egg hunts. We just started doing that when my son was 3. Now that I have 2 kids, I hide a total 4 cadburry cream eggs, and 6 small piles of jelly beans. The kids usually get an outfit, but this year they each got a small stuffed toy. Oh, and they each get a solid chocolate bunny too. I have never dyed an egg in my life, but I'm thinking next year we will. We hide real eggs too! Then we go to my parent's house, where the Easter Papa (my dad) has hidden over 100 plastic eggs. Those are the ones with money and candy. Lots of fun! WE do four dozen real eggs at home, so like you we eat boiled eggs for days. We love 'em, and eat them a few times a week even when its not Easter...guess we are egg-crazy. Mmmmmm. You got a great picture! So colorful!